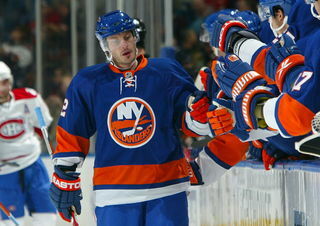 The New York Islanders debuted their new third jersey tonight against the Montreal Canadiens. You can't deny how awesome this uniform is. It just screams New York Islanders. It will one day become this team's primary jersey if I have anything to say about it. For the record, the Isles' alternate sweater debut was tarnished by a ridiculous loss tonight. How would you feel if you were up 4-1 going into the third and still blew the game? That's right, the Canadiens scored four goals in the third period. In other news, the Toronto Maple Leafs once again wore their third jersey with the Rangers in town. The home crowd was preparing for a loss, down 2-0 going into the final frame when out of nowhere New York collapsed allowing the Leafs to score five goals — and show up the Habs.